Oh, about my neck lift. If one's eyes are the window to the soul, and if the face is the frame, the entire picture you present to the world is basically from the top of your forehead to the bottom of your chin. It has more or less worked for me and on television no less, every single weekday since 1991. I am not going to win any “most handsome”contest, and that has never been my desire nor expectation. 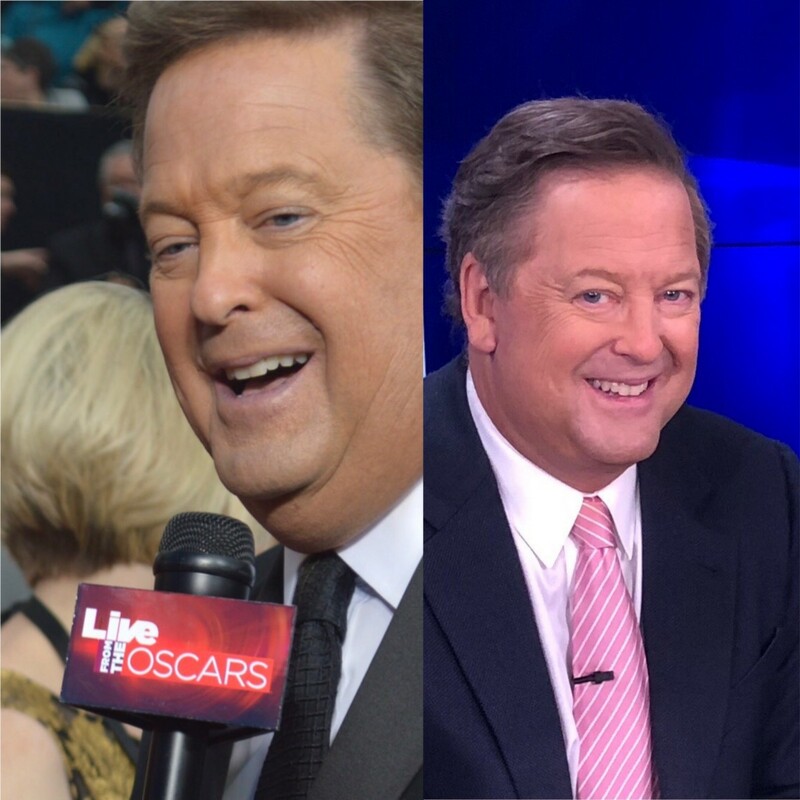 One thing that does happen when you are on television for a such a prolonged period of time, is that your physical appearance changes, you age, in many cases you thicken, you can’t really expect to beat Father Time. Like many morning TV shows, we would often have on “experts” in fitness and in beauty, and even in plastic surgery. The fitness people would always say the same thing quoting the exact same number, “85% of success in any program is based on diet,” which was 100% of something I didn’t really want to hear. I don’t think I am a glutton, but I am not a careful nor cautious eater and I have a terrible sweet tooth. I am certainly not adverse to working out but have never really settled on a regular and rigorous fitness regimen. Various surgeons would have a mixed message. “Your condition can only be cured by a full facelift,” one told me. The phrase “condition” really threw me for a loop. Others suggested various forms of liposuction, and, there were more modest suggestions, like using various cryotherapy methods to “freeze” the fat away. I took in various forms of advice but never moved forward. In a way, I was gently plagued by a sort of reverse form of body dysmorphia, I never really saw how heavy I was around the neck area. Sometimes I would see pictures and videos, but it never really permeated. Besides, I could always get a bigger shirt, and if they just shot the video from the proper angle it would all be fine. Also, and this is polishing one’s own halo, didn’t it say something positive about me, about my character, to be on TV on a daily basis, and not let something like this worry me, or slow me down. Sure I am little too tubby, but so what, I have plenty of other good qualities. The above is a perfectly reasoned if not somewhat self-serving reason to delay, avoid, or entirely dismiss the idea of doing something to remedy the situation. So I didn’t do anything, for years and years. On occasion, I would get the slightly professional nudge from my agent, who would motion down to under his own chin and say something to the effect of “you know there are people who can take care of that.” My wife added to that gentle chorus, indicating that perhaps my professional advancement is not what it could be if I would only bother to consider fixing my neck area. I had an unlikely and somewhat unwelcome shove in 2017. My longtime TV home, KTLA in Los Angeles was scheduled to be sold. The buyer was a particularly ill-suitor, known for extreme ideology and very a tightfisted nature around the purse strings. They would not take kindly to long-term and well-compensated employees. I could very well be facing a circumstance I had not encountered in decades, the need to find a new full-time TV job. Also, my phone rang rather regularly. I am lucky to have a really robust freelance career providing entertainment reports around the world for some very high profile outlets including ITV in the United Kingdom and NINE in Australia. But my phone wasn’t ringing all that much with offers of new freelance employment. That could well be a function of age, or maybe, just maybe, a little less doughy in the chin and neck might be helpful too. So I was leaning towards the idea of investigating this very foreign world when I luckily found a solution in my own TV newsroom. One of my colleagues, the entertainment reporter and TV personality Dayna Devon is, you guessed it, married to a plastic surgeon. Dr. Brent Moelleken checks all the boxes. Double board certified, deeply experienced, and unlike many physicians, I have met, more than willing to talk about his line of work, even in non-professional and social settings. Dayna herself was no stranger to a procedure or two and served as counsel and head cheerleader through this whole process. At two or three social gatherings I would just ask Dr. Brent about the remote possibility that I would consider something like this. My approach, which reflected my own thoughts and feelings was first and foremost — surely men don’t ever do anything like this. “Men do,” he told me. “Certainly women make up the majority of my patients, and women have a better understanding of exactly what they want done.” That was my first big hurdle, I didn’t know what I wanted done. What I did know, is that I wanted to take the fat away from under my chin, I absolutely did not want to look “done,” and I didn’t want anything to hurt. Dr. Brett and I made a formal appointment, and very early this year I found myself in his office. Very kindly and with a great bedside manner, Dr. Brent gave my face the once-over, and asked me this, “have you made a concerted effort to lose weight, you will have a better result if you can try and lose some weight first.” I thought that was all very reasonable, and clearly he was in no rush to get me under the knife, and frankly, neither was I. This will sound cliche, but the most important thing about this first professional meeting with Dr. Brett is that I truly trusted him. Of all those things that matter most, I knew he had my interests at heart. So several months went by, and maybe I went to the gym a little more often, and maybe I had one fewer dessert, but I certainly did not throw myself into preparations for this kind of thing. Then, and this is important too, I was looking over my calendar and I had an opening in August when I knew there was nothing special required from me for work or from family, and I could schedule a lengthy break. As it turned out, I actually did something professional, actually appeared on TV, just three days after my surgery, but that is nothing that anyone would recommend. I wanted to give myself a solid two weeks at least, to fully recover, and be able to go back to work, and my secret hope is that no one would really be the wiser. One of my biggest hang-ups is that I really didn’t want anyone to know, and I certainly, did not want to look “done” and “pulled” and all those other adjectives that go along with this kind of thing. On the night before the scheduled surgery, I had a phone call with the anesthesiologist, who was very reassuring and comforting. Just before bedtime, I did make one major mistake. I went online and looked up a video of the procedure that I thought I would be undergoing. It did not help me at all to see it. I’ll spare you a detailed and yucky description, but I looked at an under the chin incision, and it looked as if the surgeons were opening almost a second mouth. Yikes. Still, I slept really well and was ready for my big day. I arrived at Dr. Brent’s office bright and early at 7 a.m. I told him I had watched the video the night before, he confirmed my thoughts that that was a bad idea. He looked at my head face and neck and again clearly indicated what he intended to do. I was prepped for surgery, and I recall being wheeled into the state of the art surgery center, having a nice conversation for about 5 minutes with the anesthesiologist, and then….and then blank. I have asked Dr. Brent to fill in here….what exactly did take place. What happened to me while I was on that surgical table. Here is what he did. “In the OR I first removed the fat, which was over 100cc, not a personal record but pretty close…. I’m glad we were able to tighten the deep layer and the skin next because at this point in the surgery there was a good amount of loose skin after the fat was removed. Next, I interlaced the neck muscles with the NeckLace technique, which tightens the neck muscle, just more broadly and with more fixation points than with the usual neck tightening procedure. That’s his story, here Is the rest of mine. I have absolutely no memory, at all, of what happened in the operating room, or for several hours afterward. The next thing I knew, I was in a comfortable bed, with a massive bandage around my head, and I was attached to an IV drip. I was not in any pain to speak of, I felt that I had “been through it” to a degree. Where I was staying was in a hospital room, trying its’ very best to look like a hotel room. Soon a series of very friendly nurses and technicians came by, assured me that everything had gone well and that when I felt like it, it was helpful to try and walk a little bit. None of this was too hard or too taxing. It is definitely something, you would not want to do every day, but all and all, I felt fine. Almost perplexed that I could be knocked out cold for such a prolonged period of time. I took a few gentle laps around the recovery center floor, had a very nice restaurant quality dinner, and went to bed. I had a little trouble adjusting to the massive turban on my head, and more than a little trouble being connected to the IV. So I slept well for the overnight, with a few interruptions for nursing checks, etc. The surgery was on Monday, now by Tuesday midday I was home and had already stopped taking the powerful prescription painkillers that had been made available. “You want to get off that stuff as soon as you can,” cautioned Dr. Brent. As you can clearly tell, I am no brave soldier, but I am more afraid of potential problems with that type of thing than any post-surgical pain. I spent the rest of Tuesday and all of Wednesday more or less just resting. On Thursday morning, the world learned of the death of the legendary Aretha Franklin. Since I was on a scheduled vacation, I was able to file a report via telephone for KTLA here in Los Angeles. 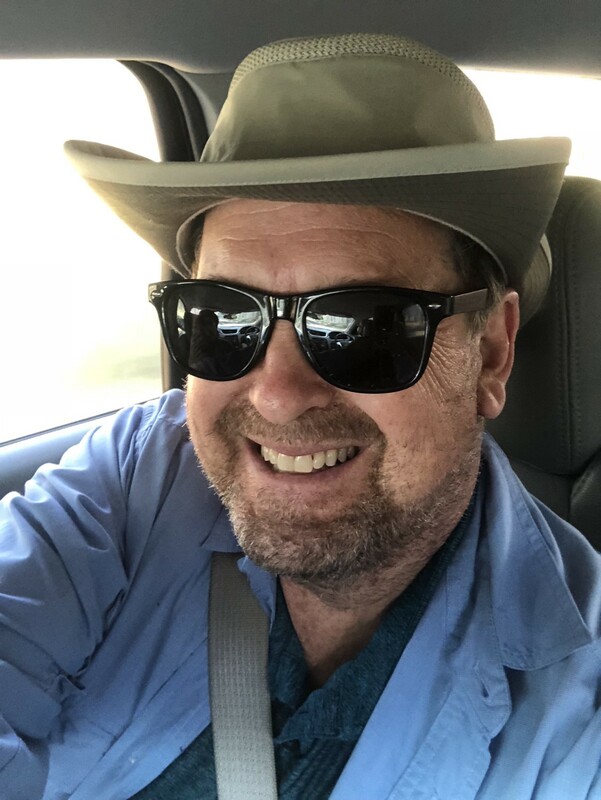 Like anyone working in media, I have a side gig or two, and my main one is filing television entertainment reports from Hollywood to several outlets around the world, including the “Today” show in Australia. 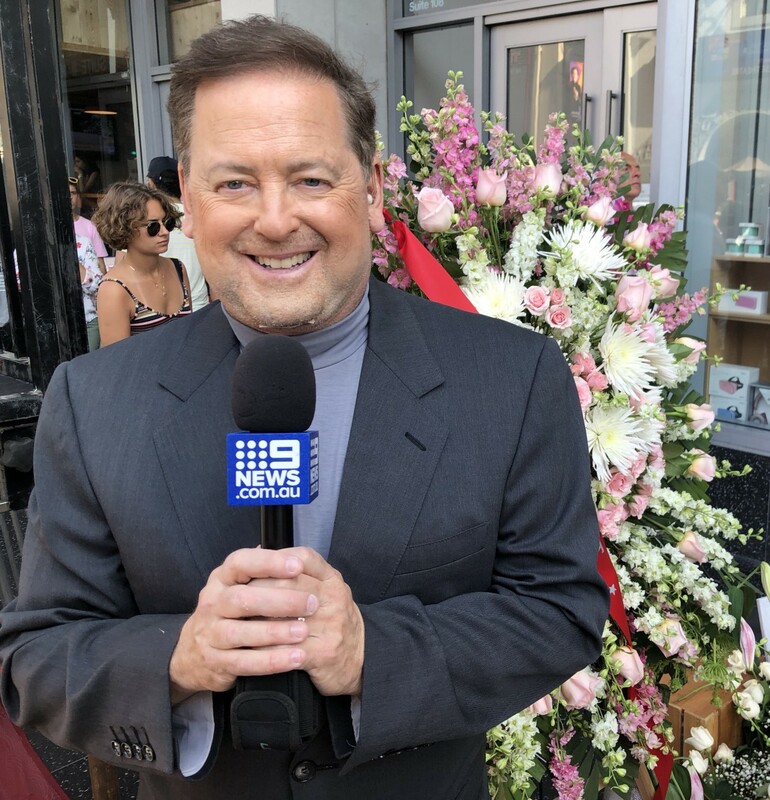 The Aussie’s were adamant, they wanted a live report Thursday afternoon from Aretha Franklin’s star on Hollywood’s Walk Of Fame. 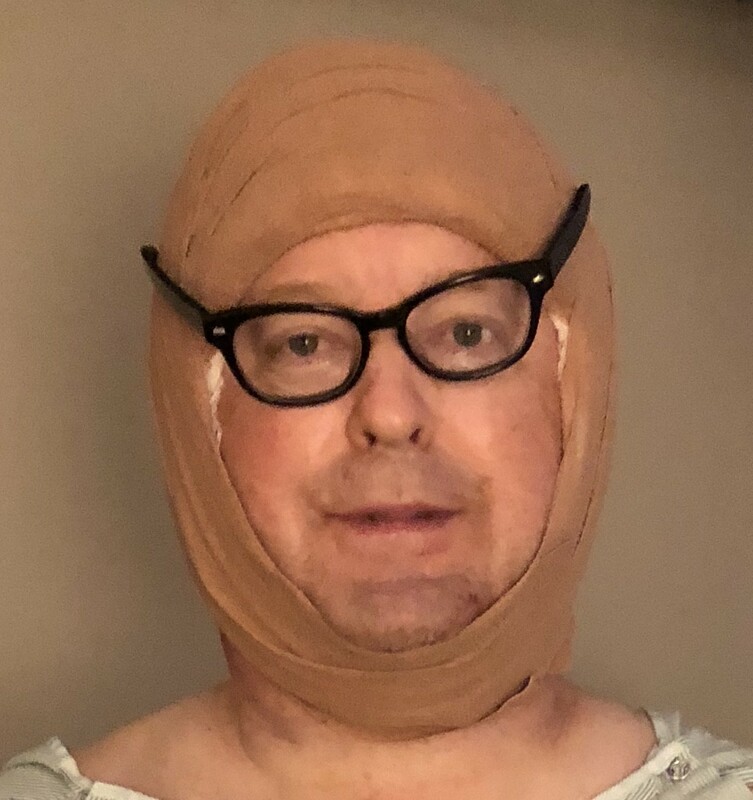 I was just three full days out of surgery, but thanks to a trusty turtleneck I had ordered in advance, and even with visible sutures, I was fully able to pull off a series of TV reports, and no one watching was the wiser. However and this is worth mentioning, a local TV colleague, KNBC’s Gordon Tokumatsu saw me up close and personal, and between the sutures and the swelling it was very clear to him, I had had something done. I meekly smiled and said “wisdom teeth removal,” but he knew better. To be honest, even with my “leave well enough alone” philosophy, I was very comfortable with everything done to me. To effectively hide any sutures or scars, I decided during my on-going “hiding out period,” to grow a beard. I have never really tried one before and didn’t think I could really do it, but I had allowed myself a full two weeks of post-surgery recovery, and really did want to hide to some degree, I thought a beard was the best way to go. The next challenge, a previously scheduled “boys trip,” an annual get together with many friends of mine from back in the day, some of the guys I have known since elementary school. Seven buddies and I, and this might be “a guy thing,” or “a beard thing,” but not one person brought up my new look. In an effort to continue to connect with my existing TV audience, I shared several pictures of the boys trip on social media. The comments all read like endorsements to me. “You look so relaxed,” “You look so young and happy,” “You look like you have caught up on your sleep.” Maybe all those things would be true just as a result of the trip, but I think the surgery helped a little bit too. Back to Los Angeles and the day before I go back to work on my daily studio based TV job. First, the big shave, and after removing all the facial hair, a long look in the barbershop mirror. I can tell there is a change, but happily, to me, it doesn’t seem like an overly dramatic one. Dr. Brent and his team have done a really great job with “aftercare,” I have visited him and his office staff several times during this two week period. There are frequent check-ups on the healing process, a few sessions sitting under a bruise reduction lamp, and Dr. Brent himself, always reassuring and offering plenty of time to answer my endless and I am sure banal questions. What is required to be “a good patient.” Dr. Brent says that compliance with aftercare suggestions is important, in my case, wearing a chin strap of sorts during the overnight hours. And patience. Incredibly, the results of the surgery improve over time. You look even better and less done. Oh, and how much does it all cost? I think there are a variety of variables involved, but surgical work of this quality is not inexpensive. You could easily take a family of four on a pretty nice Hawaiian vacation, or buy a fairly nice used car, or refresh your look which should, at least in my line of work, enable you to work longer and buy more trips to Hawaii and more cars. I am saving the final paragraph here for when I actually return to the airwaves, but just this afternoon I was taking my son to his karate class. As I sat watching the class practice various punches and kicks, I noticed a figure across the studio in the mirror. He kind of looked like me, but no longer had that big ring of blub around his neck. Then I realized, and this initially came as a bit of a surprise. Wait, that is me. And despite a slew of initial reservations, I am really happy with what I have had done.